I recently wrote about How to Increase Conversions By Sharing Pillar Content When Your Audience is Most Receptive and mentioned using the semantic Twitter search engine FeelTipTop and a unique Twitter alert search and respond app iTweetLive. By using TipTop first to see typical search results for any given keyword phrase you can fine tune what you set up in iTweetLive and greatly reduce the amount of time you’ll spend weeding out searches that were either too general or have too many other meanings. manually review and delete those that did not work later. It is often easier to understand when you see a real life example – and understanding is a faster way to be productive with a new tool than trial and error – and that gets you results much faster. If you are tempted to skip this I encourage you to read on. Read to Succeed program to encourage reading in this Library Blogs post. 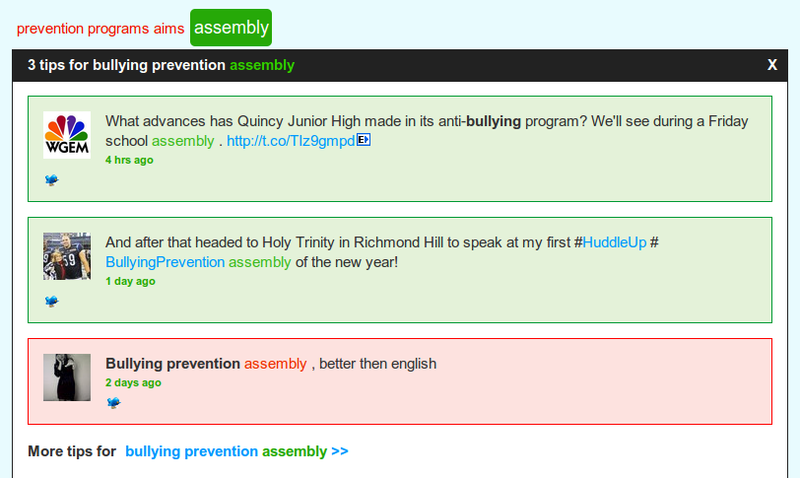 Buddies Not Bullies: his bullying prevention assembly program featured in this bullying statistics post. By first searching for the word “bullying” in FeelTipTop it is immediately obvious that there are far too many tweets that include that word – most of them from people who are reacting to news or other tweets who would not be in need of a bullying prevention program. deleting tweets that do not need replies. FeelTipTop suggests additional keyword phrases that I can test to find just the type of tweets that are worth replying to and eliminate most of the ones that would not be interested. Additional "Insightful Topics" Suggested by FeelTipTop related to my Bullying Prevention Search - Ignore those not revelant - hone in on the ones that are. Clicking on any of the suggested words highlights the tweets that contain that word. For example, ‘School’ is highly relevant because anti-bullying programs are most commonly presented in schools as is ‘assembly’. Notice that Tip Top provides you with an important and time-saving web usability feature: breadcrumbs to get back to your previous search. See the red arrow and text in this image pointing out the Breadcrumbs - All sites and especially ecommerce stores should use these so your visitors know where they are on your site and how to jump back one or several pages to where they were. By testing each potential search first I am able to hone in on tweets by people who can benefit by knowing about Domino’s anti-bullying program and the excellent statistical data provided by Statista on bullying. Notice that on the original search screen – which you need to remember can be accessed at any time by clicking the Inputs tab – there is a ‘select city’ dropdown. If your business wants to reply to geographically targeted tweets this feature could become very useful. We need the developers of Tip Top to let us know what that feature is trying to do? Does it use the location in the Twitter bio or is it looking for locations? This post explains how to build refined Twitter searches using Tip Top. See part two to be published soon for how to set up iTweetLive using these searches to automate the search process to increase conversions through offering solutions when your target audience WANTS them. Very good topic! I read all is the best because I search a lot of same article. I will share with my friends! I have never tried this Twitter search engine before. It seems that it’s good for internet and affiliate marketers to search targeted prospects easily with this feature. Thanks for the heads up, it’s a gem for me! Do you know any inernet marketing basics affiliate marketers in your area? Thanks for letting me know abt tip top iam gonna start using it legally to get more out of twitter. You have demonstrated that the Feel Tip Top search engine can be a valuable tool. Obviously, it saved you many hours; and earned you customres you might not have had. Like other tools, Feel Tip Top needs to be correctly used. Thanks for the manual! David Sneen would love you to read ..How to Earn $57,600 a Year! WoW this will make my work piece of cake. I can’t tank you enough. I believe Twitter has so much to say in the near future so i am trying to use it as much as i can. Thanks for the info on Tip Top…never heard of it before. I have been neglecting my Twitter account for sometime now and focusing on other traffic generation and social media outlet. I need to get back into building my business via Twitter. TipTop is new for me, First time I am reading this, thanks for the share…….. I always wished that my tweets were re-tweeted. I have been active on Twitter for two years now and only have 42 followers. I have heard and read in a number of places that if you get re-tweeted then people tend to follow you in the hope that they may benefit from the information that you post. Twitter has been a major source of news in the modern age with the pace and speed that it makes possible. I will try to use your inputs and hope to benefit from them soon. Agree >> Marketing through Twitter can be helpful and this is the first I have read about Tip Top. Thank you for the excellent info here. Twitter amazes me and although I have slowly started to build up followers I can’t help but feel overwhelmed with how many great tools there are out there like FeelTipTop to help with IM. Right now I am still in the process of connecting with other people in order to gain a following and I am anxious to try this out. I’ve been using Raven Tool and Hootsuite, I’ll need to check this out soon, thanks. Marketing through Twitter can be helpful and this is the first I have read about Tip Top. Thank you for the excellent info here. I was using google to find the twitter searches and select date etc., This is the best tool ^_^ and made my work much easier…thanks a lot. I have been SUing twitter regularly and this iTweetLive looks like any other scheduled Twitter search tool meets an auto-responder. I’m sure it may tend to encourage spam if not properly setup, but most Twitter tools run that risk as well. Dont you agree?? That is a very helpful article that you have written there I will definitely keep these in mind.Thank you. The Twitter search engine is very different from the normal search engines and I find it really difficult to find stuff on it. This was a much needed article to help me get better acquainted with the social network site. Now I am quite sure that the navigation on Twitter will be much easier for me after this read. Cheers. Thanks for a the informative advice! Never heard that twitter has search engine too.. I think I’ve got it – it’s some sort of Google Insights, but for Twitter, right? This is great news! Thanks for sharing. Great advice, I often find it hard to imagine what search terms people might use. Was not aware of this TipTop tool. I think Twitter should be utilized as much as possible for the business purpose. As you have posted that using TipTop tool may reduce the time required for searching keyword manually. This tool would prove to be very beneficial. Thanks for sharing! The number of Twitter tools can be a bit overwhelming, but there are some great ones out there that certainly can make Twittering a more efficient process. I hadn’t heard about TipTop yet but it looks to be a valuable tool – I’ll have to give it a better look. to search tweets that relevant to your niche. I’ve never heard of Tip Top either. I like the idea of having aTwitter tool that can geo target your results. That can make a huge difference with local businesses. Very cool way to weed through the mass of non-relevant keywords and focus in on the ones you actually want to reply to. Will come in handy, many thanks. FeelTipTop really sounds to be a great method to weed through non relevant tweets and to find the most targetted tweets to reply to. This certainly is a conversion booster and I am certainly going to try it out. WOW! When I read the title of this post, I was a bit flabbergasted to be honest. However, after reading the whole post, things started to make sense. Great discussion of how to build refined Twitter searches using Tip Top. This is the first I’ve heard of Tip Top. But as you describe it, would seem to be especially good at leading to highly relevant, targeted results. Thanks for the detailed presentation of an important topic.